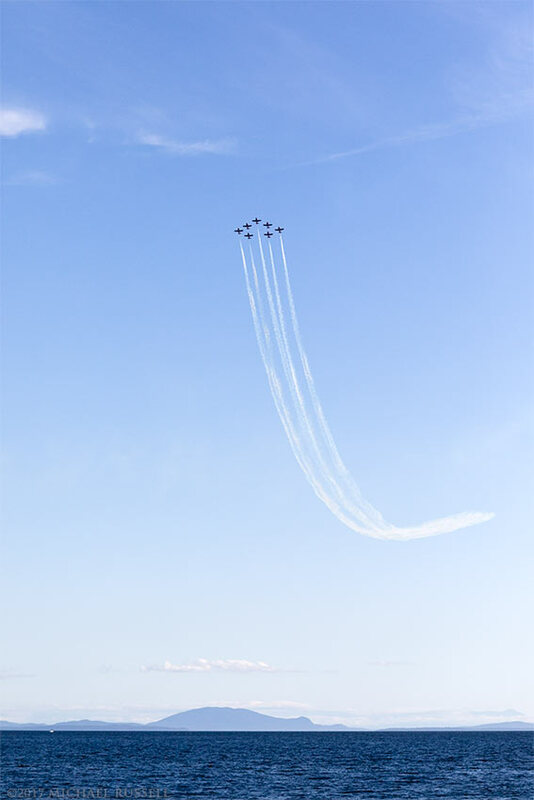 Canadian Forces Snowbirds in a Big Arrow formation above White Rock, British Columbia, Canada. 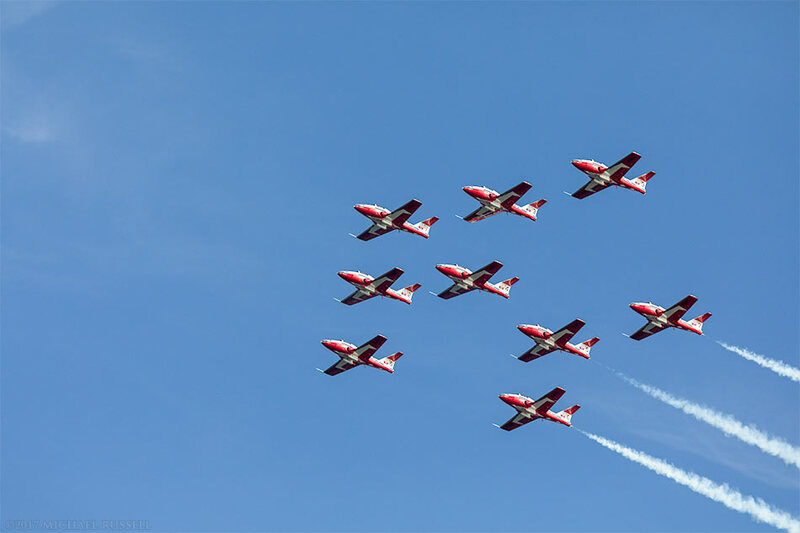 Earlier this month I had the opportunity to photograph the Canadian Forces Snowbirds flying over White Rock, British Columbia. 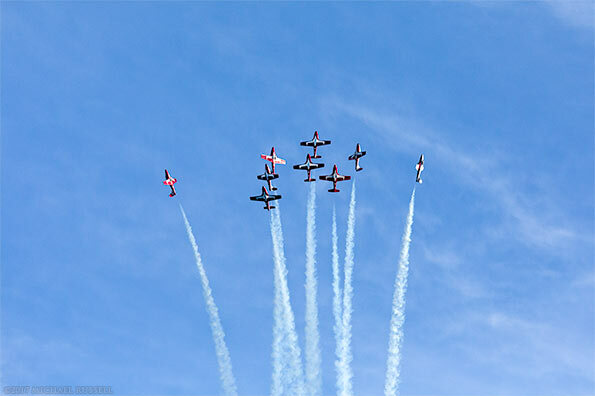 The 431 Air Demonstration Squadron have been performing in airshows with the Canadair CT-114 Tutor jet under the name Snowbirds since 1971. 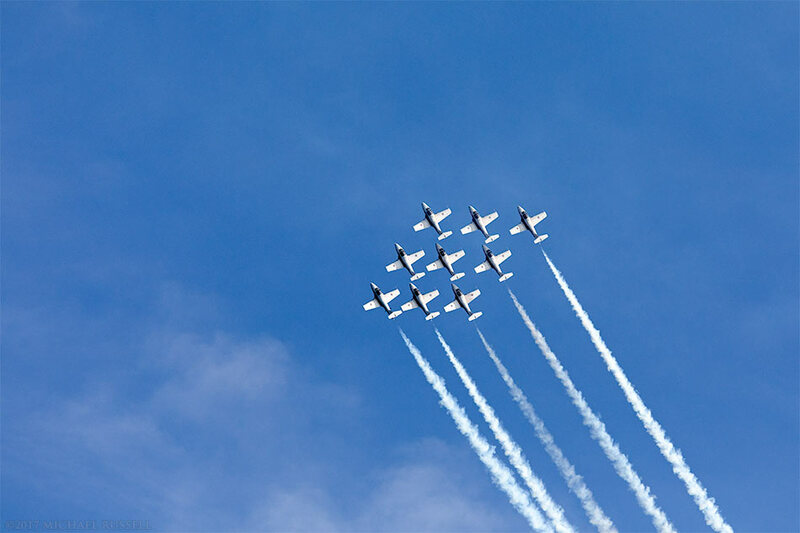 They fly around 60 air shows in North America per year. I’ve seen them before at the Abbotsford Air Show but as I haven’t attended that event in over 20 years I have not seen their performance in a long time. When I learned that they were performing in White Rock I decided to photograph them for the first time since probably the late 1980’s. This was going to be a lot different than shooting them on film when I was around 14! Armed with my new camera I picked out a good spot along the promenade in White Rock to watch the show. I chose a location that was slightly west of the pier, as I figured that would be the focal point. As the Snowbirds were going to perform around 6pm I decided I’d rather spend time looking south and east away from the sun than looking (and photographing) into it. This proved to work quite well, as I only had to stop tracking the jets through my camera to avoid the sun a few times. Normally I photograph relatively still objects – mountains, trees, waterfalls etc. They don’t move around, and so the focus tracking capabilities of my various camera bodies have rarely mattered. 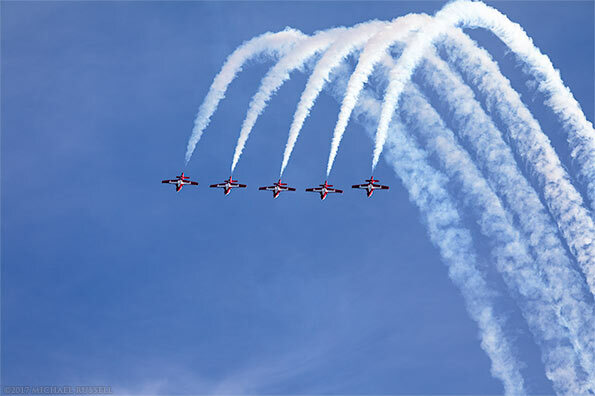 Photographing the Snowbirds is quite a different thing than I usually work with, so I was curious how the auto focus on my new camera would work out. At the end of the evening I had roughly 300 photos of the performance and none of them were out of focus. Normally I’m used to having to delete some photographs with subjects like this as they are blurry but this was not the case this time. Picking the images I wanted to process took a bit longer as I didn’t have unfocused shots to throw out, but I’m not complaining at all! The website for the Canadian Forces Snowbirds shows the various formations they use for their performances. It took me a while but I think I’ve correctly named all the formations and looping/burst maneuvers I photographed. If I had this to do again I’d probably record audio of the broadcast that accompanied the performance to more easily determine all the formation names after the fact. 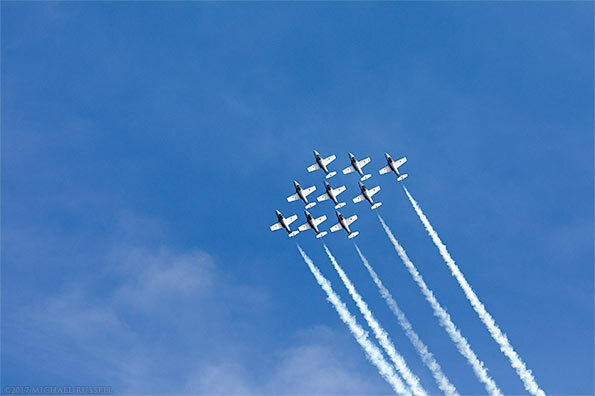 For the 23 additional photographs I made of the Snowbirds visit my Transportation Gallery.